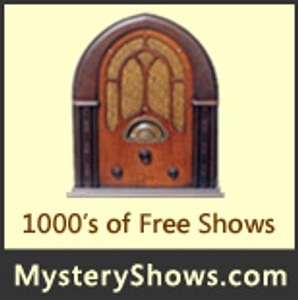 Enjoy the fun and excitement of listening to thrilling Old Time Radio mystery shows. Experience a professional cast of actors, great scripts and thrilling suspense. Please visit our website (MysteryShows.com) for more great shows like these. If you like this podcast, you'll love our Old Time Radio file sharing club. 48,000 shows in .mp3 format currently available for download. All genres available. If you enjoy this podcast, please rate it on iTunes. Thanks! A man must take his schizophrenic wife across the high Pyrenees to get her to the hospital, but her delusions persuade the locals on the way that he is a threat to her life. Broadcast in the late 1940s, this adventure series centers around the travels of a tramp steamer called The Scarlet Queen to exotic ports of call in the Pacific. The show's use of the ship's log as a narrative device is reminiscent of Star Trek and may well be where Gene Roddenberry lifted the idea from. The stories themselves are a pleasing mix of swashbuckling Indiana Jones and hard-boiled detective, liberally seasoned with saltwater for flavoring. In this episode, the ship is chartered for a lucrative voyage, but before she can set sail, the first mate is accused of murder and it is up to the captain to prove his innocence. While vacationing in London, Scottland Yard informs Bill Leslie that he is an exact double for a wanted murder. See what happens when Bill takes matters into his own hands. While vacationing at a ski lodge Margo is kidnapped and taken to a creepy sanitarium. Can the Shadow get to her in time? Find out now! A couple finds themselves stranded on an isolated country road at night in the middle of a storm. If that's not bad enough... There is a murderer on the loose that just escaped from a mental institution! Starring Cary Grant. Original broadcast 1950. The background is as interesting as the plot. Who remembered that sixty years ago you could make gramophone records in your own home the way you make CDs today? Here the lead-up to a murder is captured on record by the victim and it's up to Nick Carter to make sense of it all. A friend of Dan Holiday's who was teaching at a college was engaged to be married when suddenly his fiance's uncle "committed suicide" and she called the engagement off and was determined to marry someone much older than she was. Listen and find out what the uncle was involved in and who found out and how the tangled mess got solved. One of the rare comical episodes of Suspense. Arthur Ross (writer) Elliott Lewis (director) and guest star Jack Benny combine to give us a whimsical thriller about a talkative small-town nobody who runs into an old acquaintance... who happens to be a bank robber. Jack is soon playing the leading role in a hold-up without knowing it. The robbers' theory is that he's such a boring and unmemorable type that none of the witnesses will even be able to describe him! This Halloween will mark the 70th aniversey of the Orson Wells broadcast "War of the Worlds". Because of its format, many listeners who tuned in late believed the play about an invasion from Mars to be live news coverage of the actual event! Public panic ensued. Even out for a quiet drive in the country, Nick and his assistant/girlfriend can't help but stumble over a curious murder. This time it's a woman who dies at the wheel of her car for apparently no reason. You may be ahead of the sleuth in parts of the plot, but it's an entertaining journey to get to the finish. Sherlock Holmes solved this case without meeting with any of the suspects. He was attempting to retire to his bee farm when the case became irresistible. Listen to the show to find out what these scientists were doing with radium and why all of them disappeared. This mostly faithful adaption of Edgar Allen Poe's classic tale of intemperance, murder, and supernatural justice features the unmistakable voice talent of Peter Lorre in the starring role. Lorre is at his manic best as he draws the listener along on his journey into madness at the hands--or should we say paws--of a mysterious ebony feline named 'Pluto'. Mystery In The Air was an limited-run anthology series, which originally aired in the summer of 1947. Each episode featured Peter Lorre in a different spooky or suspenseful tale, "culled from the pages of world literature". Mystery In The Air only ran for eight episodes, but each is an audio gem in its own right. When the body of a man is discovered in a freezer dressed in a devil costume, why isn't it reported to the police? And, just where did the body go when Candy Matson tries to show it to the police? Listen to Devil in the Deep Freeze and find out. A masquerade party, a body in the study and misleading clues make this mystery one not to miss. Simon, a movie star, an assasin a shrink and Card sharp all add up to a mystery that anyone would enjoy. Frank Merriwell and his pals must help a new friend before it's too late. Window washers are dying mysteriously. Can Nick Carter find out why? A murder has been committed. A hitchhiker on a rainy night could spell trouble. Rocky Jordan must solve the mystery of murder, a treasure map and backstabbing friends in cairo. Martin Drake must solve a murder that's tied in with a treasure map.